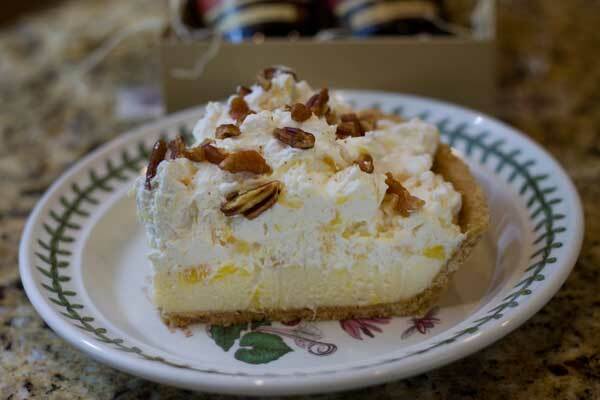 Millionaire Pie is a family favorite, and while I don’t know the exact origin of the name, it’s reasonable to assume it comes from the rich ingredients — whipping cream, pecans and butter. There’s another version of the recipe made with condensed milk, but this small Millionaire Pie is closest to the one my grandmother made. She would sometimes add bananas, top it with cherries and call it “Banana Split Pie” or double the recipe, add bananas, make it in a 9×13 inch pan and call it “Banana Split Cake”. My husband and daughter aren’t banana fans, so we leave them out. If you do add bananas, make sure to eat the pie all at once so they don’t turn brown! Prepare the crust as directed on the package and let cool. Beat the whipping cream until soft peaks form. Beat in the vanilla and the sugar. Fold in the pineapple. Set aside. In a second bowl, beat the butter and 2 confectioners’ sugar until creamy. Beat in the vanilla, egg and salt. Spread the butter mixture over bottom of the shell, then spread the pineapple mixture over the butter mixture. Sprinkle top with toasted pecans. If you plan on using a homemade crust in a standard 9 inch size pie shell, you can keep the butter/sugar mixture the same and increase the whipped cream/pineapple mixture by 1 1/2. As written, this works best in a smaller size pie shell such as the ones you find on the baking aisle. Anna, I very rarely use any egg substitutes, I don’t pay attention to what is available. We just use the “real” thing. I was just thinking about the prices of pasteurized whole eggs versus something like Egg beaters. I’ll check on Safe Eggs though. That coconut extract sounds wonderful — definitely going to check it out and some of their other flavors. Thanks for introducing me to this line of extracts! June, here are the ingredients: Madagascar vanilla bean extractives in water, pure alcohol. Karen, that’s a good question. I am not sure Egg Beaters would have the same thickening power since they are made with egg whites and flavorings and don’t contain a yolk, so you might not get a very stiff bottom layer. Have you tried Safe Eggs? They are a little more expensive, but not crazily so. Yes, to find a great coconut extract would be an accomplishment! Anna, in several recipes lately you have talked about pasteurized eggs. Is it possible to use the Egg Beaters type egg preparations in place of the whole egg as long as you aren’t needing the “raw” white or yolk seperately?